Want to sell your car in Northfield, south Birmingham? 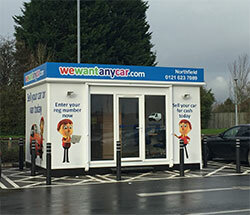 WeWantAnyCar.com’s fantastic pod location in south Birmingham is the perfect one stop shop to sell your unwanted car. Situated in Sainsbury’s car park on the Frankley Beeches Road, the pod provides a quick and simple service with expert friendly staff on hand to help, every step of the way. Just off the A38, a short drive from the M5 and a stone’s throw from Northfield train station, WeWantAnyCar.com’s pod is open every day, 9.30 am till late, always ready to give you a great deal on your car. WeWantAnyCar.com’s professional service takes out the hassle that can come with selling your car, starting with its free online valuation tool. By entering your vehicle registration number on our website and a few other details you will receive an instant, no-obligations quote. If that puts a smile on your face - come and see us in person by booking in an appointment at the Frankley Beeches Road location. With same day sales there really isn’t any reason to go anywhere else! Not only that, but we promise to match any other valuation you have received*. Don’t forget to bring all your documents with you and plan an alternative route home – just in case you get bowled over and end up selling your car there and then! After visiting another car buying company, I was a little unsure of whether to give We Want Any Car a chance of offering me a decent price for my car. I was however, very happy with the service and price offered. The person who dealt with my sale was polite, confederate and laid back. There was no pressure and it was a very easy transaction. I would highly recommend We Want Any Car above any other car buying company! John at Northfield branch was very pleasant, very quick no nonsense process, in and out within 40 minutes. Stewart at the Northfield branch was great for talking me through the process of selling my car to wewantanycar and had great customer service skills. No problem at all. Staff member was very polite and professional, and was not pushy at all, giving fair evaluation of the cars quality and wasn't there to take money of valuation for every small scratch and stain. Yes, would have got more on private sale but didn't need the hassle and time delays, and got better price than the more familiar similarly named competitor. Evans Holshaw offered more initially but lowered price further, so overall this was the best of the 3 online companies I considered. Only quibble is that it took 4 days for the money to reach my account. In an age of internet banking and same day transfers, this is excessive. Yes, I could have paid for faster turn around, but I consider that this should be part of the standard service and not an extra - I am already taking a price lower than market rate for the vehicle in terms of the companies (otherwise reasonable) mark up.